Around 1640 the small village of Kevelaer had suffered greatly from a tragic fire and the ravages of the Thirty Years war. It was considered a vast moorland and a place where few ventured. Hendrik Busman, a pious traveling salesman, was on his journey from Weeze to Geldern when he stopped at a cross on the heath of Kevelaer to pray for a few minutes. I looked around me — but saw no one. I resolved to press on and put all thoughts of the phenomenon out of my head. About a week later, I passed the place again and there heard the same voice speaking the same words as before. Then I heard it again a third time. I was sad because I was poor, and I had no means by which I might build a shrine. Nevertheless, I saved regularly from my petty cash in the distant hope that one day I should have a fund to fit the purpose. Convinced that the vision experienced by his wife was a confirmation of his Heavenly assignment, Hendrick used the little money that he had saved and began to construct a shrine according to Mechel’s description. This was supported by the parish priest of Kevelaer, Rev. Johannes Schink. The portrait was a copper-printed picture measuring only twelve centimeters tall and eight centimeters wide. 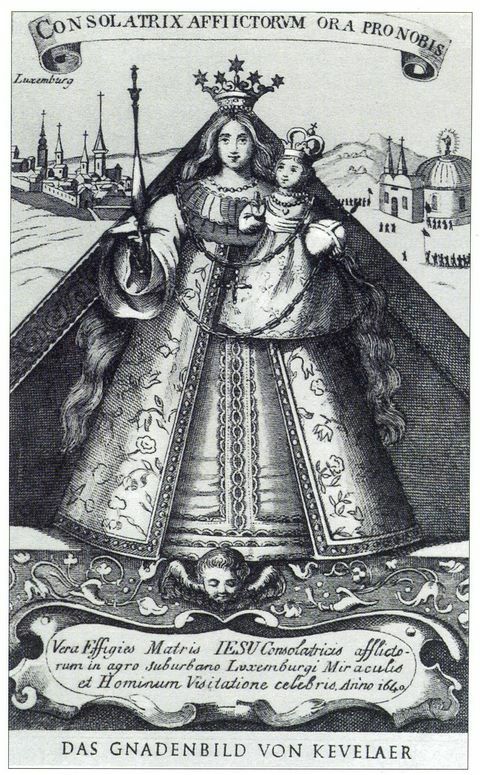 “Our Lady of Luxemburg” was known as the “Comforter of the Sad and Depressed” whom everyone had worshipped during the Pest Epidemic of 1623. The text on the picture said, “A faithful portrayal of the Mother of Jesus, The Comforter of the Sad and Depressed renowned for miracles and worshipped by many people.” At first, Carmelite nuns of Geldern offered to keep it safe during the construction. After that, during a temporary period of caring for the image in his own home, Hendrick appealed to the Capuchin priests to house it safely in their chapel because so many pilgrims were already traveling to venerate the image. The crowds became so great that monks soon asked for him to please take it back as soon as he could for placement in the shrine. On June 1, 1642, Rev. Schink officially brought the image in great ceremony to the new shrine where large crowds awaited. Miracles were soon reported. On September 8th, feast day for the birth of Our Lady, Reinier and Margaretha van Volbroek traveled with their invalid son, Peter, who had been paralyzed for five years – unable to walk or stand. Although his case had been declared hopeless by physicians, just two days after their visit to Our Lady of Luxembourg, Peter was totally cured and able to walk again without any difficulty. A woman suffering open wounds on her legs that no treatments had helped for years was healed miraculously after just two visits. Her healing was so dramatic and profound that it was reported by the Mayor of Huissen, Holland for official documentation on August 13, 1643. Many other miraculous cures were documented at the shrine. Five years after Hendrick’s death, the old chapel was replaced by a new one in 1654. A basilica was built between 1858 and 1864. Today it is a huge and beautiful complex with multiple buildings, bubbling fountains, and an outdoor Stations of the Cross. The little picture of Our Lady, Comforter of the Afflicted, has been decorated through the years with golden angels, golden roses, golden medals, and jeweled ornaments – donated by grateful pilgrims. In 1892, the 250th anniversary of the shrine’s inauguration was celebrated with a papal coronation – a crown studded with diamonds and jewels, placed above the picture. On May 2, 1987, Pope John Paul II visited and worshipped the miraculous image.